When I think of summer I imagine being outdoors soaking up the sun and being on a boat! If you follow our blog then you know that I’m an avid boater, and love anything that reminds me of the lake when I can’t be on it. Fire Pit spaces have become popular these days. It used to be that you would only see a fire pit area at a cabin or lake house; now you find them all over! It’s not unusual to see them in your neighbor’s backyard or a patio space at your attorney’s office! Check out this nautical themed fire pit area below. I feel the subtle use of navy blue and white striped pillows with the lantern and wine bucket adds a nice touch of the lake to this space. I see outdoor firepits growing even more in popularity as more commercial spaces desire to offer an outdoor working space for its ‘untethered’ employees. Sunbrella Defiance inhibits the growth of bacterial, mold, fungus and mildew and is able to be cleaned with bleach. Sunbrella is a fabric brand that is widely used in the marine industry. You can make boat tops, umbrellas, cushions, pillows, and more out of their fabrics. The best part is that it is mold, mildew, and water resistant and easy to clean. It also comes in hundreds of colors and patterns making it very customizable. The commercial industry just couldn’t let us boaters hog this amazing fabric to ourselves and now many commercial textile companies carry Sunbrella. It’s versatility and heavy-duty nature makes it perfect for heavily trafficked areas and outdoor patios that many offices are implementing. Sunbrella has recently created a new antimicrobial line, Defiance, which is perfect for healthcare settings as it inhibits the growth of bacterial, mold, fungus and mildew and is able to be cleaned with bleach. 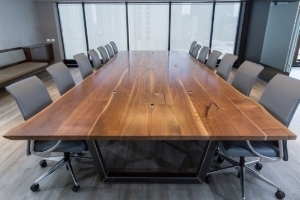 The use of reclaimed wood is a growing trend in commercial and residential furniture. 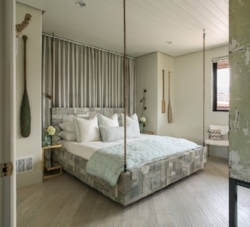 This bed is made of reclaimed wood adding nautical ropes to give the illusion that the bed is floating off the floor. Adding the boat oars as décor to the wall brings the lake life inside. Reclaimed wood in general is wildly popular within the commercial realm as well, as both owners and manufacturers are striving for more sustainability. We mentioned in a previous blog the company ICON Modern, based in Chicago, which focuses on furniture made from reclaimed wood. Also stay tuned for a Project Profile of Optimize Rx, who incorporated reclaimed wood in their renovation of a historic building. Many of the manufacturers that we work with have created unique, nautical inspired wall coverings that totally get us in the boating spirit. Manufacturers like Designtex and Florim USA areon the nautical bandwagon; let us present exhibit A and B of aquatic themed wall covering and ship-lap style tiles. Finally; don’t believe us that ‘nautical’ is the 'it' trend for 2017? Pantone even agrees with us! Three of Pantone’s Ten Spring 2017 colors are shades of blue with one in particular described by Pantone as “the desire to escape to pristine waters”. Haworth and other manufacturers have even embraced this nautical inspired trend with fabric and finishing choices available on many of their products. Are you feeling inspired yet? Give us a call if you’d like to implement any of these in your own space. That’s all for me, I’m off to the lake! ISCG Goes Wild & Why You Should Too!